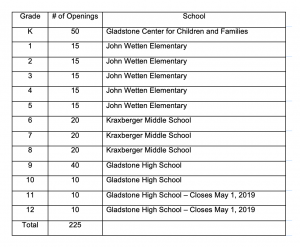 The Gladstone School District will welcome transfer students from other districts for the 2019-20 school year, and invites families outside the district to apply beginning February 1. Spots are available on a first-come, first-served basis for 225 students in grades K-12, including 50 openings in kindergarten. Once admitted, students can remain in the district through graduation without reapplying. All applications for admission will be approved on a first come, first served basis beginning February 1, 2019. Students accepted for inter-district transfer must abide by behavior and attendance expectations for the transfer to remain valid. These include: (1) Attendance must remain at 92% or greater; (2) No more than one suspension per academic year; (3) No suspension of greater than 5 days. 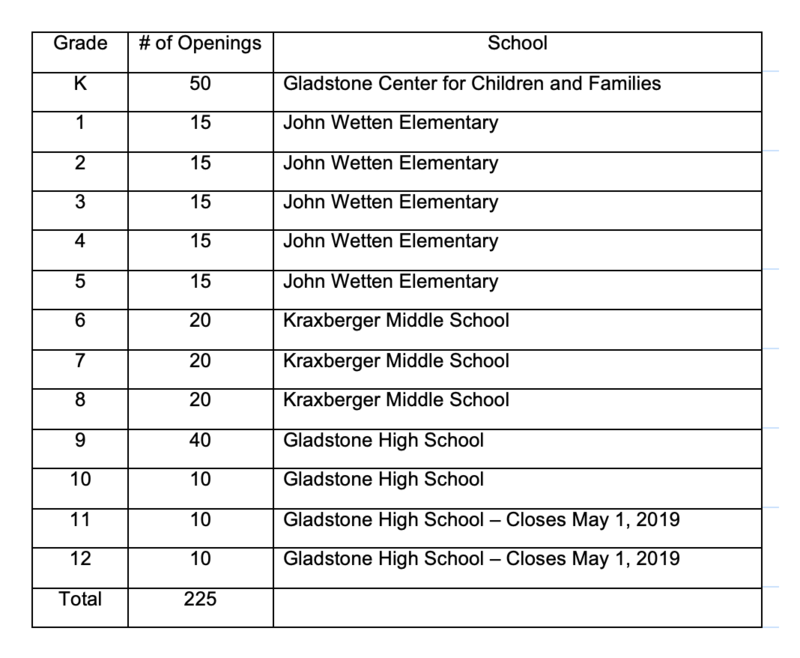 Questions regarding the inter-district transfer process for admission or release may be directed to: Natalie Weninger, Administrative Assistant at 503.496.3935 or weningern@gladstone.k12.or.us. Inter-district transfers will be in effect, with continued enrollment, through graduation.